For many families, healthcare costs can add up over the course of a year and represent a fairly significant tax deduction. However, it can be easy to lose track of those expenses and the amount you’ve paid out of pocket if you don’t have a central place to record all of those expenses. Liz emailed and asked if I could put together a healthcare costs log, an idea I loved because this is my least favorite part of doing our taxes as well. With this form, you can track each expense — whether it’s a prescription, doctors visit or lab test, with all of the information you need, including the date, who it’s for, who the provider is, a description of the product or service and the amount paid. There’s a checkbox on each line for you to record once it’s been sent to your insurance company, HSA account or whoever you may need to send it to. Use this sheet to organize your 2010 records as you prepare your taxes this year, or start keeping track of 2011’s healthcare expenses now so that you’ll be ahead of the game next year! 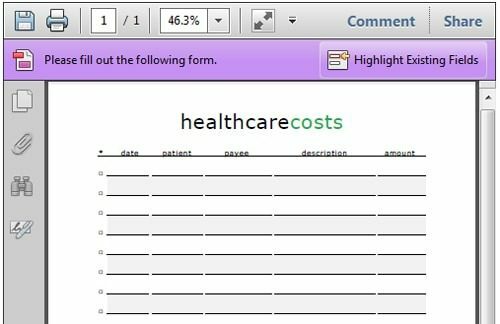 Click here download or print the healthcare costs log. Or get all of the Life Your Way printables in a single download when you buy the complete download pack for just $7! The complete set includes all printables published to date, organized by folder within a single download. It also includes free monthly email updates with any new or updated printables in a single download as well. Read more about download packs here.